But what about place? In the stories of Abram/Abraham and Sarai/Sarah, each time they have an encounter with God, they mark each place with an altar of stones. Jacob does this same action, using his stone pillow as base for the altar. In all of the travels of God’s people in our Hebrew Scriptures, so many “mark the place” where they encounter God. Perhaps as a way to acknowledge the encounter with something tangible besides a memory, or perhaps as a landmark for whomever may come that way to know that something special happened there. So special that someone needed to “mark” it. I have not moved much in my life; all the places I have called home have been in the same city – the same place. But I have been to many places that have become my favorites in my mind – too numerous to count. Most I have not “marked” with a token to others or myself. These have been places of liminality, places where I knew something was happening that words could not describe. The feeling of crossing a threshold into holy space. The sense of being in the presence of the sacred. Nature is usually involved. And so often, indescribable to anyone but myself as it is fleeting, yet lingers. 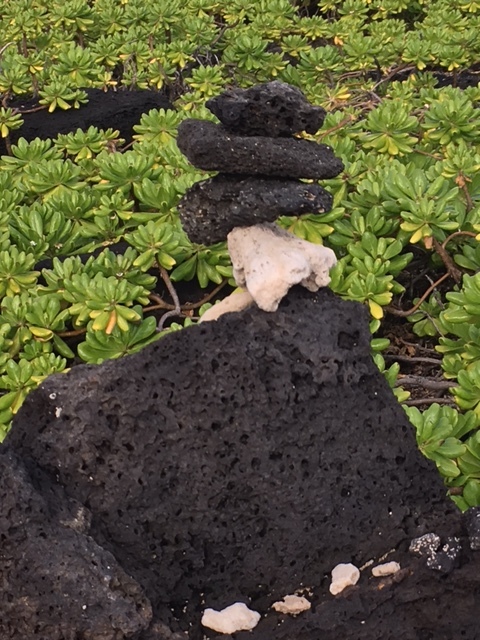 In my travels, especially along wooded trails, beaches, and mountain outcroppings, I have seen many “marks” that others have made with stones (cairns), one stone gently laid on top of another. Some very simple with only a few stones, others piled precariously high. Traditionally, a cairn is a pile of stones that marks a place (such as the place where someone is buried or a battle took place) or that shows the direction of a trail. 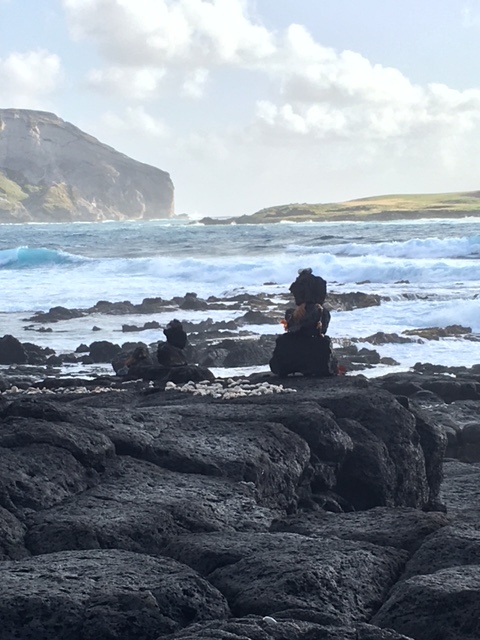 In Hawaii, we saw many cairns with names of people spelled out with shells. Cemeteries often have stones resting upon the headstone or crypt. Each place set aside by someone for a purpose known only to them. Stuff of earth that can be grasped in the hand to symbolize or remember something that words cannot express – something ethereal, something beyond our reach that we want to grasp and hold onto. Marking a place of encounter or remembrance. 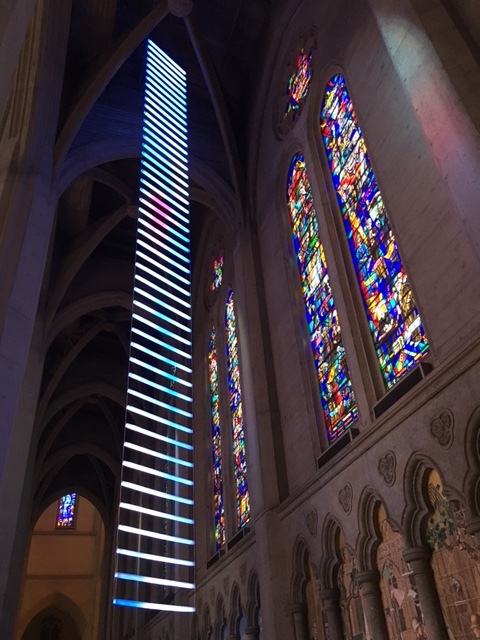 “Jacob’s Dream: A Luminous Path” by Benjamin Bergery and Jim Campbell is made of rungs of LED lights and rises 55 feet from base to top. The LED rungs acts as a fragmented screen for low-resolution moving images of enigmatic figures that ascend and descend the ladder. 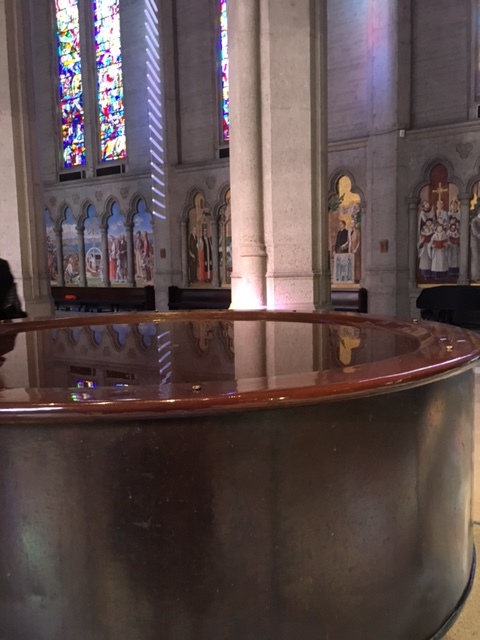 The installation speaks not just to the Bible story, but also to the cathedral’s theme for 2016, “Home,” to the connections between the visible and invisible and to our own personal journeys on the ladder of life. How do you mark your personal journey on your ladder of life? Love the imagery…and the discussion questions. Thanks for your reflections.